The newest book by Max Lucado. I have to admit this is the first book by Max that I have read. Yes you read that right. I have never once read one of his books. Now I know what people are talking about. Fearless was an amazing book. We all face things like: job loss, health issues,doubt worry and concern for our children. Other things like self doubt, fear of disappointing God, fear of violence, fear of death. Max Lucado eloquently addresses these issues with personal stories and stories of other peoples struggles. And takes each of these issues and leads us directly to promises and scripture that will equip us to trust in God and Fear less. I was drawn into this book. It was an easy book to read. Not a self-help filled with strategies and acrostics and methods. I is a book that takes you directly to scripture that reminds you or introduces you to God's promise. It takes you directly to individual scriptures and stories. And in Max's ability to tell a story he takes these stories from the Bible and makes them real. Brings them eloquently into present day language and describes the situation where you can understand and relate. In today's world when we face daily challenges and struggles and issues that are out of our control. It is easy to feel troubled and anxious. Even as a believer a follower of Christ we all have days where life seems to just swallow you up and you need to feel God's love. God's protection and his strength. And many times you don't know which scripture to go to. This book addresses so many different challenges, struggles and issues that people really do face. And it takes you directly to God's answer. To trust and Fearless. If you know someone struggle with trusting God. I highly recommend this book. And, now that I have read it I look forward to reading more books by Max Lucado. Now I know what all the talk is about. This is a great book for a small group or other group it contains a discussion guide at the end and there are additional resources available. This book is available at Amazon and you can go here to read a few pages. Has your week been as busy as mine. It has been crazy busy. And filled with incredible Blessings and opportunity personally and for the ministry. Below is a photo of how I have spent most of the week. I had to babysit alot! I know he is adorable. You White Wednesday and 2nd Time followers might remember the table. I was moving it and it ended up right beside my computer table temporarily but it became a wonderful play area. He had the best time. And yes he is a he. Sorry the toy is pink he doesn't realize it. Please don't tell him. It was free. Free is good. I added one more photo for you. Because my week has been so busy I need a few minutes of peacefulness, relaxing and just enjoying God's promises and provision. This photo says those things to me. One of my joys. Thanks for letting me share. I have not forgotten about announcing the Gift a Way winners. I will do that this weekend. Please forgive the delay. TOMORROW or I guess it will be later today because here in Texas it is already today. OK that sounded crazy but it is 1:00 in the morning so it is really today but seems like tomorrow. Now that you are totally confused. I will be posting the winners tomorrow or today....LOL of the Gift A Way. I have been preoccupied the last few days with keeping the grandbaby. With my daughter and son in law and the grandbaby. the thing that has really taken up all my time. Farmtown. I am addicted. It is my new addiction. I love it. I know you guys are thinking this women has lost it. And maybe I have but I am so enjoying it. And I playing with my daughter so it is that much more fun. So with all that said. I will announce the winners tomorrow. Welcome to Thankful Thursday hosted by Sonya I found her a few weeks ago and I enjoy her simple suggestion of listing 5 things we are thankful for. 2. That I was able to find healthy tomato plants and pepper plants and some not so healthy looking brocolli. I am praying the brocolli produces! 3. I am thankful that God answers our prayers and provides. Especially in ways that I never fathom. This week a lovely couple cleaned out prior to a move and gave us some really nice things for our house a truly unexpected gift. 4. I am thankful for friends and that God gives us special relationships when we need them. 5. And lastly I am thankful God allows me to mentor some fabulous young ladies. And I am thankful that I get to take them to church. And one last thing I am thankful that Leslie accepted Christ this week. Yea! And I am thankful that You came by to visit today. Please leave a comment and say hi. 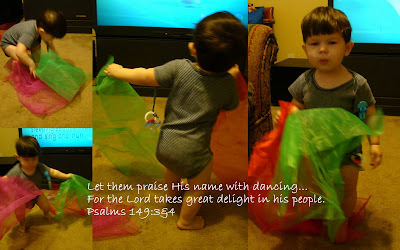 May we Praise His name and dance with exuberance....when I took these photo's I couldn't help but think about Praising God. And before you go my this is the last week for my Gift A Way. There will be three prizes if your posting a WFW entry today you don't want to miss this! If your not posting you can still enter. Go here for all the details. And remember the more comments you leave the better your chance. Entries close on Saturday so come back Thursday and Friday be sure and leave a comment. And for another chance follow me on My Journey. I knew when I received this book that it would be a easy read. A simple plot and simple story. I enjoy reading inspirational romances and romantic suspence. I enjoy long books that take me days to read. But sometimes I just have a few hours and want to enjoy reading a simple story. It might be considered predictable but aren't all romances? Isn't that why we read them. Boy gets girl in the end? I enjoyed A Man of His Word because it was a wholesome book. The Amish setting of course lended to the wholesomeness. It was interesting to learn a little about the Amish beliefs and how they live within thier own society but yet with Yankee's (anyone not Amish) and; Yankee ways of life. Although I really enjoyed this book one thing I personally didn't like was the use of Amish words. There is a glossary at the front of the book and it did get rather annoying to go to look up a word when your in the middle of a sentence. I think it would have been much more enjoyable without the added few Amish words here and there. I was pleseantly surprised that the book includes a Reading Group Guide. This was a positive to me because I do a reading group with teenager girls living in a Halfway House. This book would be great for younger teenage girls. I would recommend this book for the adult reader who wants something light and easy to read for a quiet evening. Or because it is fast and simple to read and because of it's wholesome values it would be a great book for a teenager girl. I would highly recommend this book and I would purchase other books in the series. I am always suggesting Christmas presents and again this one would be good. You can find it at Amazon. Thanks again for stopping in. Don't forget to go check out my 2nd Time Tuesday post. And don't forget that I am still doing the Gift A Way leave a comment to be entered. Welcome to Thankful Thursday by the sweet Sonya over here. I enjoy Sonya's Thursday party she suggested focusing on 5 things your thankful for. 1) I am thankful that you are never too old to learn. I have learned a lot through blogging. I even just learned how to center things on my post. It was purely by accident. I have learned many wonderful lessons that I am sure God wanted me to learn. Thank you dear sisters for outpouring your wisdom to us all. 2) I am thankful that my grandson is a healthy rambunctious toddler. And that he is napping right now. 3) I am thankful that I got to go The Summit Leadership conference last week. We received scholarships and so that is another thing to be thankful. It was two days of rest and refreshment. And learning. We learned alot. Thank you God for providing this opportunity. 4) And, I am thankful for God's provision. And that God is patient with me when I am fearful and frustrated. Thank you God for providing and thank you for your patience. Please teach me and my Cowboy to be good stewards. 5) I love my house. I am thankful for my humble little cottage. It is so easy to come up with a list of things and I could make it much longer. Do you have a long list of thankful items....one more thing I am thankful for is friends I have found through blogging. And so that reminds me about my Giftaway! You have got to enter. There will be a really cool prize. It is open to anyone. All you have to do is a leave a comment. Come back everyday because each visit and comment gets your name in again. So comment on each post till the 3lst. And if you start following me I put your name in again. Over here at this post you'll find all the details about the prizes. I don't have a fancy button but if you write about my Gift a Way on your blog let me know and I'll add your name. So leave a comment here and Good Luck to you...and go and visit the other Thankful posts today you will be Blessed. Welcome to Wordfilled Wednesday and to my Wordfilled Gift a Way...Because your here today you can enter this great Gift A Way but you have to leave a comment so I know you were here. Here how you can win and what you can win.... Go here for all the details. Or just scroll down I posted them yesterday. But if you don't have time now that's ok. Just leave a comment today and back latter because it lasts till the end of the month. Answer this question: Why am I celebrating Christmas In August? And your wondering what you win.. A print of one of your WordFilled Wednesday illustrations. It has to be yours but you get to choose. Good Luck everyone and Happy Wordfilled Wednesday. This is Gift a Way is going to be a litte different but I think you will love it. I am so excited that I want to enter! Ok here's the skinny...remember yesterday I highlighted some of my favorite meme's on Mosaic Monday? Well two of my fav's are you guessed it Mosaic Monday and Wordfilled Wednesday. This Gift a Way is going to be for these two fabulous groups so if you participate in Mosaic Monday or Wordfilled Wednesday and if you already commented on my Mosaic Monday post you are already entered. And here's the cool thing there will be 3 prizes. Yes I said 3 prizes. I know I don't do math well. But really I do because anyone that has a blog can enter. The first prize will go to a Mosaic Monday participant. The second prize will go to a Wordfilled Wednesday participant. And the third will go to a blogger that doesn't participate in either. Here's the deal there are a few rules not hard not even really rules just ways to enter. But there is one rule. If you are the winner of MM or WFW then you have to agree to have one of your Mosaics or WFW posts printed. Because that is the prize. The MM winner will receive a beautifully framed print of your MM entry. The WFW winner will receive a beautifully framed print of your WFW entry. And the non participate will receive a beautifully framed print of one of the above her choice. And just to make it fun I am even sending a print of the winning entries to Mary and Amy Deane. How fun is that? • If you're a "follower" of my blog - your name and/or image appears in my "followers" list - you automatically have an entry in the giftAway. If you're not already a follower, you can become a follower now and you will receive one entry. • If you write a comment IN THIS POST ONLY, your name will be entered an additional ONE time. Multiple posts here (on this post) will not earn you multiple entries. You must visit everyday and comment each day for additional entries see below. • If you write a comment IN MY UPCOMING POSTS, your name will be entered an additional one time per day. REMINDER: Be sure to sign your posts so that I know who to credit with an entry and please remember to say you want to enter. 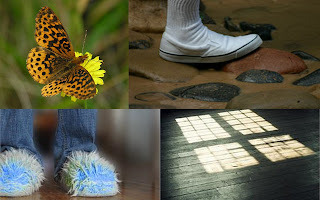 * If you visit my other blog and leave a comment there you will receive an entry. Now about your prize if your a WFW winner you get to choose which of your WFW posts you want to have as your prize. It must be your's not someone elses. If your the MM winner you choose your MM post. Got it? And the non participate will receive one of the above her choice. So now that I have written a book here. I hope your not too bored with all this. Please come by and join the party and oh one more thing...just to make sure you've read all this. If you can answer this question correctly you get another enter. 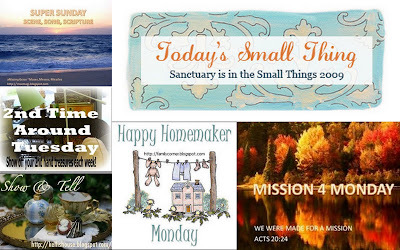 Welcome to Mosaic Monday hosted by Mary today I thought I would share some of my favorite meme's. Upper Right is Super Sunday hosted by Peggy. This meme I enjoyed doing but unfortunately it has been retired. Next is Simple Things hosted by Rachel Anne. I love this one. It is a daily meme. Rachel Anne gives wonderful ideas to organize, clean and just make your house a home. I post on Simple Things here at my other blog. Next is 2nd Time Around Tuesday. I just joined this one. It is fun. On Tuesday everyone posts photos of things they have rescued from garage sales, thrift shops or from family members and are reusing or repurposing. Below 2nd Time is my favorite and the first meme I ever did it is Show and Tell Friday hosted by Kelli. 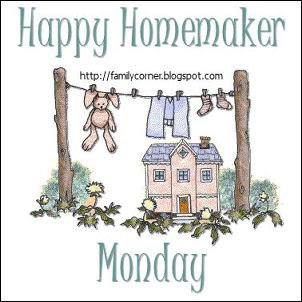 Next is Happy Homemaker Monday hosted by Sandra. She also hosts Crockpot Thursday. I don't do that one very often because I don't take a lot of photo's but I love to visit and get new recipes. 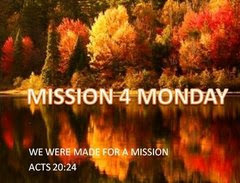 And last is Mission 4 Monday hosted by Peggy. It is a fun meme that concentrates on missions. Stop over there today. Thanks for visiting my blog today. If you have time I would love to invite you to visit my ministry blog. I left a Mosaic there too. 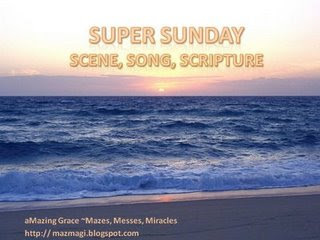 Today we are having a Simply Super Sunday worshipping together. This is a photo of my daughter, son in love and grandson. The grandson is the one being super silly slouched in his stroller. This isn't a great photo but the only one of all of them at this event. We spent the last 6 Friday nights at e Txas Motor Speedway at an event to discourage street racing. Our son in love raced his car. We were spectators. Today we are taking the 'mama mobile' to church at Fellowship Church in F.W. and then we are all going to my favorite Mexican resturant for my son in love's birthday. See why I call him that? He loves my resturatn too. I hope your Sunday is Simple, Super and Blessed. I added back my playlist today because I wanted to share this song. We sang it this week at a Leadership Conference by Willowcreek Community Church. It was an amazing time of learning and worship. Hoping your Sunday is Simple and Blessed. I am starting a new give a way or Gift a Way as I have called it please come back by this week to enter. After a long, frustrating at times, busy, fulfilling and productive week this is what I need. 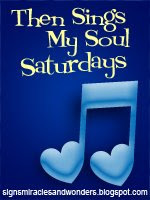 Join Amy at Then Sings My Soul for more music. Just under the wire I am getting in a Fruitful Friday post. I found this new meme when I visited Denise who sent me over here at Michelle's. I loved this meme because it is about serving. It is about writing or making a list of the things you did this week that were helpful to someone. Basically it is about being Jesus. This week I had a really busy week. It began with my attempting to help one of the girls at our halfway house. I spent hours on the computer Sunday and Monday looking for a residential program for her. She has a unique story and needs Jesus so much. She is a believerd. She loves God but she hurts herself. Because of her past she cuts herself and has made numerous attempts at taking her own life. This poor little girl has been in prison since she was 12 years old. She is now 18. And in a few month she has to leave the security of the teenage prison system. She is living in the halfway house now while the system attempts to find a placement for her. This is a sad story and I am sorry to begin this wonderful new meme with such a downer. On an uplifting note another thing I did this week was dog sitting for our landlord. If you have read my blog for awhile I have mentioned before how great he has been. His truck broke down the other day and he had his dogs with him at work. Son on Wednesday night that got to stay with us. I got about 4 hours sleep. Woke up to a 10 month old German Shephed liking my face at 2:00 am among other exciting events. This week I mailed a care package to one of the girls that I mentor. She had her gallbladder out and is recuperating. At 19 it is hard to stay at home all day. I sent a snowy scene puzzle so she can think of cool, a can of silly string, new slippers, some gum, a bowling game toy from the dollar store, and a word search book. Thanks Michelle for hosting this new fun meme. It definately will encourage us to look for ways to be helpful and helping to others. I will enjoy reading what everyone else has done to just be Jesus to others. And before you go on my sidebar you will see Donna's button about her 100th post giveway. Go by and enter. 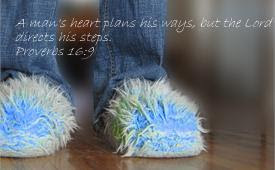 May the Lord direct our steps. Amy is taking a break from WFW today here'shttp://pennyraine.com/blog/ her sub. 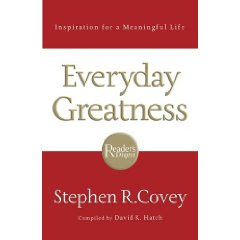 Everyday Greatness was an interesting book for me to read. Personally I had difficulty reading this book. Although it was personally difficult for me I can recommend it. I think it would be a great book for someone that needs encouragement. I am sure one of my issues with it is that it was not spiritual. I enjoyed reading the stories and they were encouraging. I believe that this is a book that I could use for a reading group that I do with teenagers. The stories highlighted in the book are inspirational in a non spiritual way. It is an easy book to read. You could start at the beginning or pick up and read anywhere along the way. You could read by subject. Subjects include:contribution, responsibility,vision, innovation, respect, empathy and many more. After each section there are quotes and a section called Reflections that include questions that encourage the reader to think about what he or she has just read. I would give this book 3 stars based on the fact that because it is a compilation of stories personally I would not spend the money to purchase it for myself. However, I would have to say it would make a great gift book for someone. I know numerous people that I would purchase the book for. You can purchase the book online at Amazon.com it isn't too early to shop for Christmas! My morning post is over here today. But I wanted to leave this sweet picture for you. I have been playing around with a few photo's you will have to come back to see what I am up to with then. And I wanted to invite you back tonight. I'll be writing a book review this afternoon. I hope your day is Blessed with angels. I wasn't sure I was going to share this video here today. It was intended to be posted here but when I went by Amy's this morning she had posted 3rds Mountain of God. I love that song and the message and the reminder. So for some reason I was drawn back to youtube this morning. I wanted to hear and see more Moutain of God videos. Ones that have the lyrics. I am a very visual learning and I love music videos with lyrics. I found a 3rd Day song I had never heard. But it was more what was written by the person who made the video that caught my attention and broke my heart. At first I didn't read the whole post but I kept being drawn back to it. I am not going to link I am not going to get into this persons business by putting it out there for everyone to read. But I am going to share the one sentence that drew me in and wouldn't let me go. ' I put together this little slide show of sorts to represent my appreciation for Jesus Christ. Note: Currently I am not practising Christian beliefs though I respect the religion..."
When I read more it broke my heart to see the hurt this person has and the confusion. I pray today that God really reveals who he really is and that her heart is broken and opened. Here's the video I originally chose. The words are below because I really wanted you to be able to read them. (remember I am visiual) I get so absorbed in the videos I can miss the message of the lyrics. Today I met a beautiful stranger. A stranger whose heart is broken and afraid. A stranger who is confused. A stranger that knows you in her head. My prayer today is that she will receive you in her heart. That her questions are answered. That you are revealed to her.